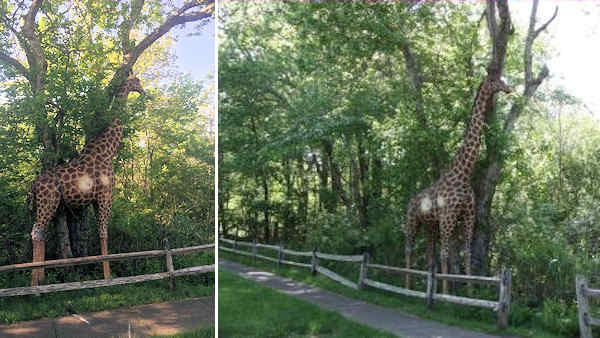 EAST HAMPTON, New York (WABC) -- A 12-foot-tall wooden giraffe was found chained to a tree in East Hampton last week. The giraffe was located at the Huntting Lane entrance to the East Hampton Village Nature Trail last Wednesday morning. Its feet were duct taped to the ground so that would not fall over. Where the giraffe came from is currently a mystery. East Hampton Village Police Chief Gerard Larsen said no one has reported a missing giraffe. However, he said there is speculation that it was part of a senior prank last week at East Hampton High School. It will be kept at the East Hampton Village Highway Department impound lot until it is claimed. The giraffe is too tall to fit in police impound.